Cardinal Symbolism. . . The beautiful red Cardinal bird is symbolic of power, wealth, and enthusiasm. Knowing what you want, and how to get it, this is the central power of the Cardinal bird. The confidence flowing from the Cardinal exemplifies the recognition of it's own powers and gifts, and doesn't take it lightly or for granted. Cardinal has come to you offering you blessings in a sacred song, the song of the Cardinal is. . . feel the flow of nature and the natural rhythms of the planet and your spirit. . . fall into flow with yourself. . . trust your power, this is your gift from above . . . emanate your true essence. . . this is the core of your power. . . fall in love with your life and naturally your spirit will shine. The very presence of the Cardinal has an aura of being strong, confident and self assured. His aura exudes his sense of self, and Cardinal totem animal is encouraging us to slow down and get to know self, to know who we truly are. The energy emanating from the Cardinal is that of a seer, that of a spiritual messenger. The crest on the head of the Cardinal brings the symbolic meaning of spiritual connection, importance and intelligence. The crest upon the head of the Cardinal seems to be reaching to the sky as an antenna for receiving guidance and perhaps messages. If Cardinal has flown into your realm today, spend time in retreat and ask yourself, what could the message from the Cardinal be showing me? Do I need to own my power, do I need to slow down. . . only you can know what the message is, and how to put it to use in your life. The Cardinal power animal medicine teaches that one must know one's self, and then the road to authentic happiness begins to be revealed as you move forward. Cardinal Symbolism and the Season of Winter. . .
Winter is a time where everything moves a bit slower, and retreats for sacred rest of the spirit and soul after the harvests have been celebrated. 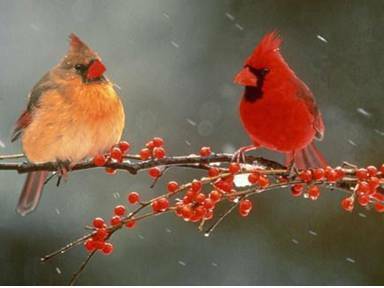 Cardinals represent the beauty of nature during the winter season, Reminding us for the need to slow down to slow down and enjoy the season of rest. In the midst of the bustling holiday season we may need to summon the Cardinal as a guide to take in the true meaning of this special time. The Cardinal is also symbolic of family, and the father Cardinal embraces the responsibility of providing and nurturing the young. The Cardinal birds are great parents, balancing the care-taking of the young in the nest. The young birds are rarely alone, as the the parents take turns in leaving the nest to find food. Striking a balance of power, family responsibility and knowing when to slow down and savor the moment, the art of balance is a particularly powerful lesson from the Cardinal spirit animal. Like the photo above shows, the balance of the male and female cardinal is poetry. She is a feminine display of grace and softness, and he is the impresario of a spiritual warrior and benediction, a righteous blend of power and good wishes.